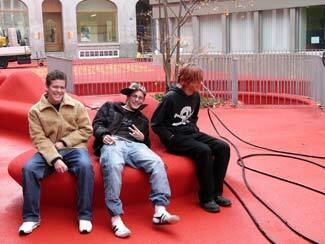 ABOVE: Teenagers relax in St. Gallen's Stadtlounge. INSET BELOW: A lighted orb above the street. St. Gallen is a cantonal capital in Northeastern Switzerland, with a population of 74,000. It was one of the world's leading centers of embroidery production in the 19th Century, when the Bleicheli quarter just outside the city's medieval old town was home to many textile factories. Today, the Bleicheli is the financial district of St. Gallen, with modern banks and insurance buildings that are more functional than people-friendly. In an effort to make the Bleicheli more lively and attractive to pedestrians, the Schweizer Verbandes der Raiffeisenbanken (SVRB) and the city of St. Gallen announced a design competition. The idea was to create a "public living room" amid the mini-skyscrapers of the financial district. The winning "Stadtlounge" or "city lounge" proposal, by artist Pipilotti Rist and the Carlos Martinez architectural firm, features a bright red surfacing that appears to have swept in like the tide, covering everything in its path. At night, the streets are illuminated by blimp-shaped objects that hang from cables strung between the district's modern office buildings. The Stadtlounge opened on November 3, 2005. On the following pages, you can see pictures that were taken the day before the grand opening. For more information on the Stadtlounge, see the Raiffeisen's description of the project. Before planning your trip to the attractive and delightful city of St. Gallen, read our St. Gallen travel article or visit St. Gallen-Bodensee Tourism.